Target has all kinds of amazing products for newlyweds, nearly everything you could dream of actually. This month I've teamed up with Target Wedding Registry to share what I believe are Newlywed Kitchen Must Haves and a creative Holiday recipe, a Classically American Stir Fry sure to wow your family. 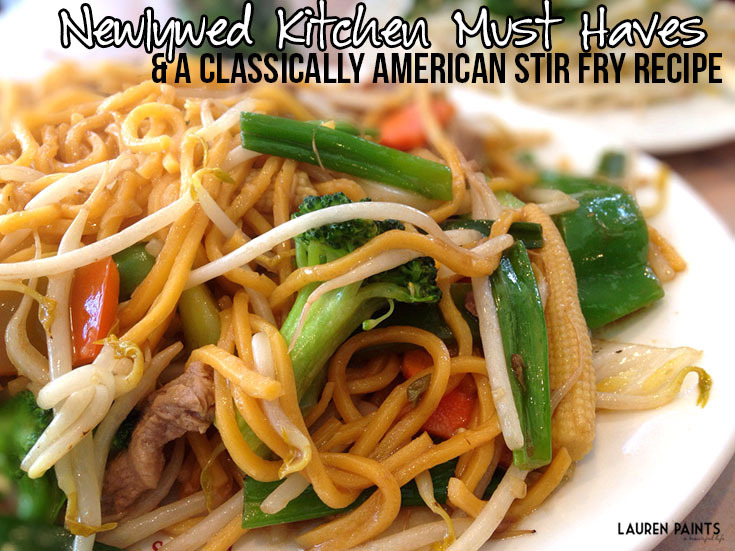 It's super easy, the perfect combination of my love for Asian food and my husbands love for classical American food and this dish is full of flavor, vegetables, and love. Perfect to serve year round, but especially perfect around the holidays! My Newlywed Kitchen Must Haves include the dinnerware set because every couple needs to be able to host another couple and have a nice, matching set of plates. The Calphalon cookware so that you and your new spouse can learn to cook together. The SONOS PLAY is a must have so that you can have a little slow dance to your song while you wait for your veggies to cook fully! The flatware because everyone needs freshly polished and brilliantly shining utensils. I think everyone needs a set of clean cut, organic cotton mitts in cream. The cake stand is pretty self-explanatory but you'll want one, I promise. The blender is for smoothies, shakes, etc. - the perfect treats for when your both busy but want something healthy and/or sweet. The tumblers are included so you can stay healthy and hydrated. And lastly, I decided to include the glass canisters so you have plenty of space to store ingredients in your kitchen. There are TONS of other things every newlywed couple will need in their family but this is an excellent start. Now that I've shared what you'll need and why you should have these items! I'm going to share a recipe you can make using most of these items. Turn on some tunes on your SONOS player and get ready for some good food. It's an odd twist on a classic dish that you'll love! Begin making the rice as instructed on package. While rice cooks, spray a stainless steel pan with cooking spray. Boil chicken until it's completely cooked, remove from water and let cool, then cut into tiny little bite size pieces. Keep "broth" for later. Chop cabbage into thin strips (like slaw), chop up onions, and use peeler to shred carrots. Add all veggies (including frozen) into skillet and toss with oil. Cook on medium-high heat 4 minutes, stirring frequently, until vegetables are fully cooked (or until they are cooked to the texture you prefer). Add chicken to vegetables. Stir in soy sauce, peanut butter, and honey (and ginger, optional) and heat through, about 2 minutes. Spoon rice noodles, chicken, and veggies into bowl, add broth amount you prefer (or real chicken broth) and sprinkle with peanuts. Now that I've shared our delicious little concoction, I'd love to hear how you add some spice into your Holidays? 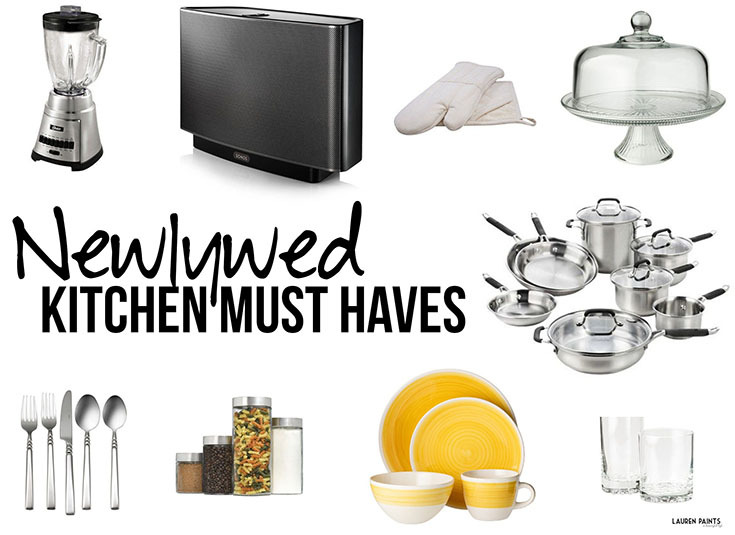 What items do you think every set of Newlywed's should have in the kitchen? Don't forget to check out Target Wedding Registry and add the awesome items mentioned above.